Apparently, "There was never just one." Or so we're led to believe. 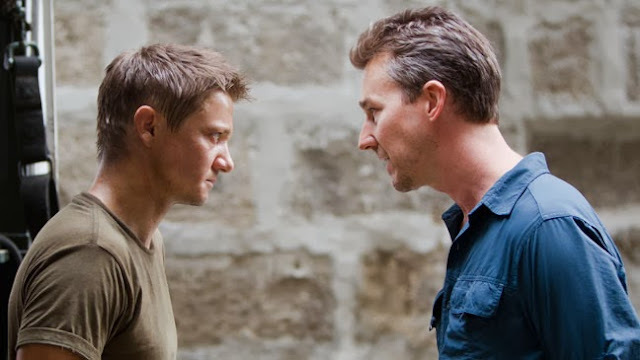 Once again very loosely inspired by the Robert Ludlum spy novels, The Bourne Legacy is a different kind of Bourne film. If you hadn't guessed, Jason Bourne doesn't show up. However, that's not for a lack of saying his name aloud (drink every time someone mentions it). Jeremy Renner takes over the franchise as a Bourne type cypher agent betrayed by those who trained him. Not a whole lot happens and unlike the original Bourne trilogy, the plot is fairly standard. There's no unravelling of a complicated, convuluted government conspiracy. We only see the aftermath of these programs being revealed to the public. There are nods and monologues concerning the fallout of Ultimatum. Renner's Aaron Cross is on the run as the CIA decides to kill the secret project that created him. This is not a reboot, but more like a side-quel. Legacy take place during and after the events of Ultimatum. From writer/director Tony Gilroy (Michael Clayton), a co-writer on every Bourne film, this one takes a stark departure from the previous entries despite adhering to the basic plot conventions. Identity directed and spearheaded by Doug Liman (who hired Gilroy and instructed him not read the novels) then taken over by Paul Greengrass for Supremacy and Ultimatum, Legacy veers off the set mythology in its own story while still exploring Ludlum's cinematic spy world. The biggest flaw and drawback is a lack of villain or credible threat. Edward Norton plays the nearest thing to a heavy but never leaves the confindes of CIA offices. He is under utilized without a real motive or arc of his own. There is another Bourne type agent that tracks Renner and costar Rachel Weisz (who is great as Renner's frightened accomplice without ever being annoying) down, but he's another nameless, faceless robot tasked to hunt down Cross. There's a different language to the film without cinematographer Oliver Wood, editor Christopher Rouse, and composer John Powell, who all worked on every previous film and helped established the recognizable Bourne cinematic style. It's slow to start and with a generous two-hour plus runtime, little of consequence happens. Each scene and sequence is compelling and watchable, but there is no momentum. The finish is anticlimactic with an open-ended non-ending and no third act. Renner is good and compelling with what he's asked to do. He is a convincing killer and agent. His older, more hardened look contrast the graceful, baby-faced Matt Damon as Bourne. There's not the same complexity to the story and Renner's performance and demeanour reflect that. Cross is not out for vengeance or to expose the government's shadowy project, but only to maintain his own skills and enhanced abilities. The Bourne Legacy is well-made and scripted. However, its ideas and plotting invite inevitable and unfavourable comparisons with its predecessors. It fails to both set itself apart and adhere to the iconic style of the original trilogy. It lacks substance and recycles old ideas while offering only a cursory of new developments. On its own merits, it mostly succeeds as a smart thriller, but lacks a coherent mythology to fit in well enough to the overall Bourne universe. It's an interesting exercise in unconventional franchise filmmaking.